On a regular basis marketers build and execute campaigns, introduce new products, run channel marketing programs, manage massive advertising budgets, and introduce new service lines and business segments; for which they must find, and sell to, new customer segments. The launch and implementation of a new corporate identity however, represents a much rarer thing as it occurs once every 15 to 20 years (on average) for most companies. Owing to this, many marketing executives might only be involved in this type of project once or twice in a career. The level of scrutiny that a project like this attracts across all customer touchpoints and customer service areas throughout the organization is simply unparalleled. For branded assets such as architectural signage, this is a once in 20 to 30 year opportunity to bring consistency. A smart rebranding initiative often entails changes in major areas such as business model alignment and corporate culture. The nature of this type of project will often impact every department and group within the company.For medium to large size companies, seven- or eight-figure investments will be required, along with tens of thousands of internal man hours. The marketing communications organization will remain in the spotlight for the duration of the project which may take the better part of a year before it is substantially launched. It will take multiple years to fully complete the brand conversion and to bring the expected benefits to fruition. While it can vary dramatically depending on company size, complexity and mix of branded assets, the duration of this type of project from brand strategy and corporate identity development, through detailed planning, and complete roll-out of a new brand can last anywhere from 15 months to three years. The chart also illustrates the roles and functions of a branding / creative agency and the brand implementation management (BIM) function. To meet these challenges, a proven framework and a range of expertise, both internal and external (i.e. a branding agency and BIM consultants), are required to help ensure rebranding success. Approximately 80 percent of attention and focus is on the brand strategy, brand identity development, and creative, supporting marketing /advertising campaigns. However, brand implementation is arguably just as important. For many projects, branded asset conversion represents both the majority of the budget (55 percent to 75 percent depending on industry, number and types of assets) and internal manpower efforts (60 percent to 80 percent man hours). Best practices for brand implementation management involve three distinct phases. BIM starts with an assessment of a company’s branded assets and work effort for conversion based on Executive or subject expert (SME) interviews, data gathering requests, physical site visits. The end deliverable is a final assessment report that should include conversion strategy options and scenarios, recommendations, timelines and schedules, project organization recommendations, as well as the cost estimate(s) for the rebranding. The diagram below identifies the approach taken both with internal and external resources. 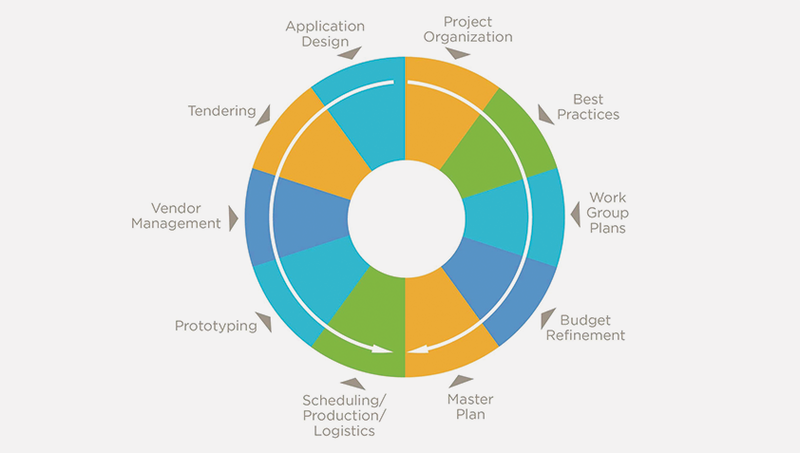 The right hand side of the wheel identifies the internal resource efforts involved in building out a Project Organization, providing these teams with best practices, templates and guidance to help them develop detailed Work Group Plans including more refined budget estimates. The aggregate of all team plans and budget refinements provide the input into building the overall Master Plan for the rebranding implementation. 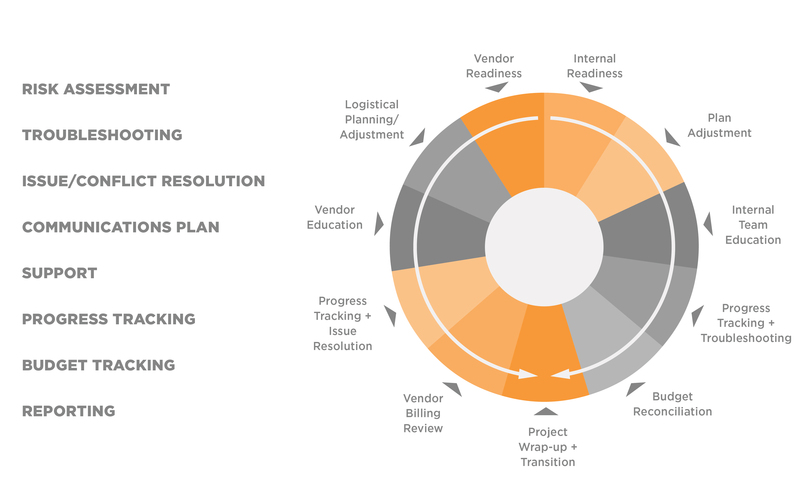 The left hand side of the wheel focuses on requirements for sourcing, vetting, tendering and selecting vendor partners who will support the rebranding efforts. While existing vendors may already be in place, the nature and scale of a rebranding means that the capabilities of existing vendors must be critically assessed. A rebranding effort is not business-as-usual, and vendor partners need the expertise, scale and capacity to manage the intense effort required to support a major rebranding. Again, the diagram below emphasizes the internal and external readiness and execution steps. The right hand side of the wheel focuses on assessing internal readiness, plan adjustment, execution and tracking of the plan and budget. The Brand Implementation Consultant role includes risk assessment, troubleshooting, issue or conflict resolution, communication plan support, progress and budget tracking and reporting to all key stakeholders and the clean wrap-up and transition of any residual activities to internal work group teams or departments for longer-term completion beyond the substantial completion phase. The left hand side of the wheel focusses on external vendor partner management and execution. Ensuring supplier readiness, review of logistical planning and production scheduling, execution and progress/budget tracking. In particular, making sure “Quick Win” opportunities are capitalized on, and detailed management of vendors for the conversion of assets like architectural signage, fleet graphics, employee PPE and uniform change out, etc. After substantial completion, the BIM consultant ensures that any longer-term remaining activities are cleanly transitioned to internal resources or departments to manage along with the ownership of key vendor relationships. With millions of dollars of cost, and tens of thousands of man hours of internal labor involved, amidst the risk of negative reactions from the marketplace and investors, a corporate rebranding initiative is the definition of “high risk, high reward”. If done right, however, rebranding also represents a set of activities that have the potential to deliver significant rewards: corporate financial benefits; stronger market presence and brand value; a vehicle to drive major corporate cultural changes; and, at a personal level, as the type of successful initiative that could be one of the highlights of a marketing career. 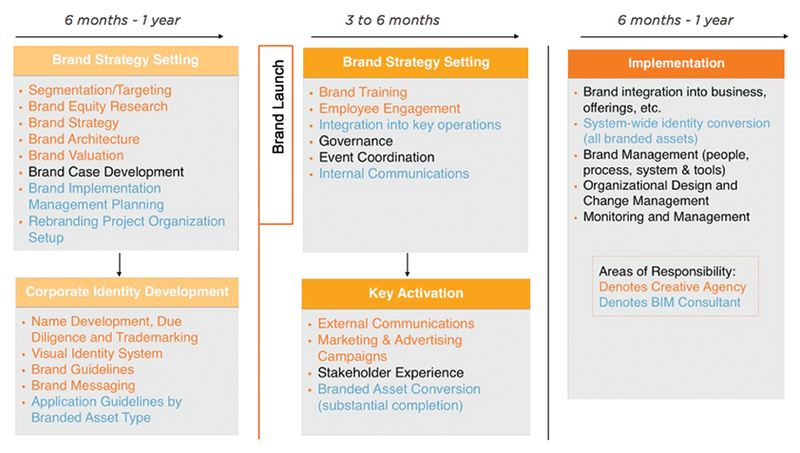 Which phase of brand implementation would your organization get most excited about? Does understanding the process make it seem less daunting and more feasible? Let us know in the comments below and subscribe to receive the latest Shikatani Lacroix insights in your inbox.